We take a closer look at the words and phrases that are trending online and in the media. This week: ‘Reiwa’. The word on everyone’s lips this week? ‘Reiwa’. 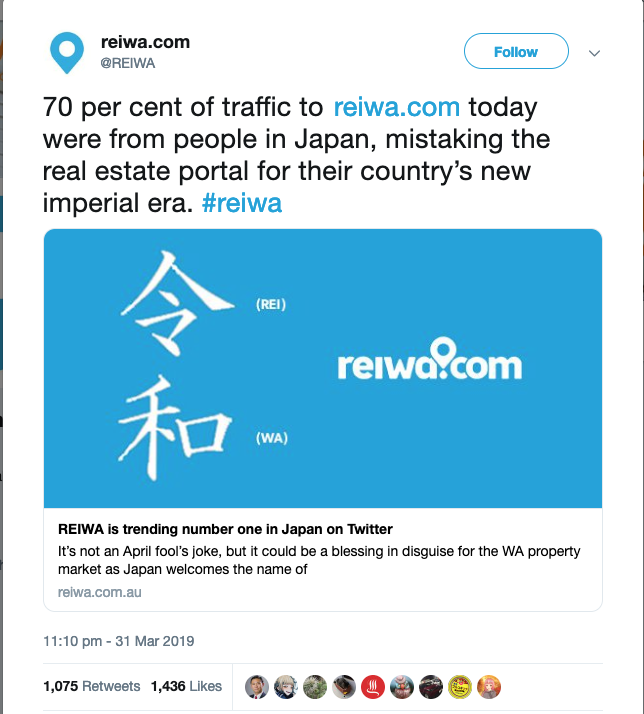 Following weeks of top-secret cabinet discussions, the name of Japan’s next imperial era was revealed to be ‘Reiwa’ and has got the world – including your trusty east London content agency – pondering over its meaning. The current era will end after 85-year-old Emperor Akihito abdicates on May 1st 2019. He is the first Emperor in 200 years to step down, relinquishing the Chrysanthemum Throne to his son, Crown Prince Naruhito, the 126th Emperor. Usually, the era names are only revealed once one ruler has died and the new one has taken the throne. In Japan, each imperial era name – or ‘gengo’ – aims to set the tone for the upcoming decades, appearing on coins, newspapers, driving licences and paperwork. It is an unavoidable part of Japanese day-to-day life. If we were to apply this age-old tradition to Britain today, we might consider ‘Brexit’ an appropriate contender for oh, I don’t know, the next upcoming millennium? Made up of two characters, ‘rei’ and ‘wa’, the word – which was the number one trending hashtag on Twitter in Japan on Monday – is thought to mean “order or command” and “peace or harmony”. Each era sees one name on a shortlist – put forward by scholars of classical Chinese and Japanese literature – chosen by Japan’s cabinet. The name hails from the “Manyoshu”, Japan’s oldest poetry collection. In an unexpected twist, the new name has proved something of a boon for one Australian estate agency, which saw a 70% increase in traffic to its website as everyone scrambled to Google the term. The site’s address? Reiwa.com. The word does not come without its controversies, however. ‘Reiwa’ has been met with a mixed response – mainly due to the “forceful nuance” of it. Across social media, many have commented that ‘Rei’ – which can be translated as, “command”, “order” and “dictate”, and features in the Japanese words for official announcement and law – has an authoritarian, militaristic undertone. Combined with ‘wa’ (“harmony” and “peace”), academics have suggested the meaning of ‘Reiwa’ implies Japan is being ordered to achieve peace. In our turbulent times, amid the rise of extremism, the reality of climate change and the confusion of Brexodus we wonder whether some enforced peacefulness and order is such a bad thing? Perhaps the Japanese have got the right idea. If we were to name our next era ‘sanity’, would it do any good?